Here's how the paving and restriping dance will go: We'll start closing the lanes at 8 p.m. Friday, July 29. 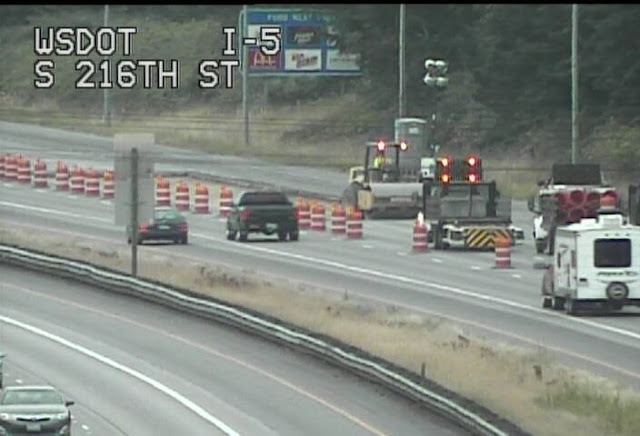 By 10 p.m., southbound I-5 will be reduced to the two left lanes, starting just south of SR 518 and ending near SR 516. Then, on Sunday, they'll shake it all about and switch traffic to the two right lanes. All lanes will reopen by 5 a.m. Monday, Aug. 1. Switching a work zone from one side of I-5 to the other can be a bit tricky. We've got to move a lot of orange traffic barrels, all while keeping traffic moving. That's what the crews will do this weekend between 6 and 10 a.m. Sunday, depending on how quickly crews complete paving the right lanes. When crews are shifting traffic from the left to the right, drivers should expect big backups and delays. A better bet will be to use alternate routes like I-405 and State Routes 99, 167 and 518. Drivers should also consider traveling early in the morning, taking transit or carpooling or postponing travel. 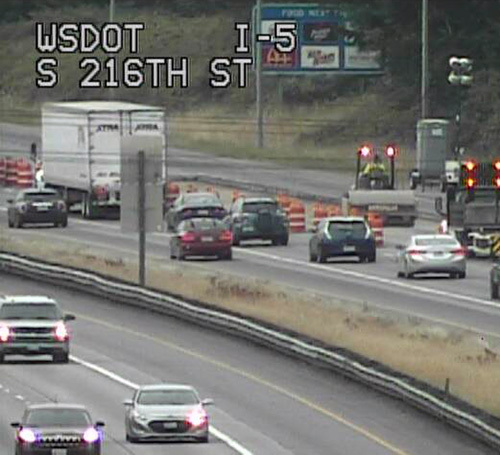 If you choose to stick with I-5, please bring your patience and give yourself plenty of extra travel time. Looking ahead, we'll take the weekend of Aug. 6-7 off so we don't interfere with Seafair traffic, but then we're back to work for the final two closure weekends. 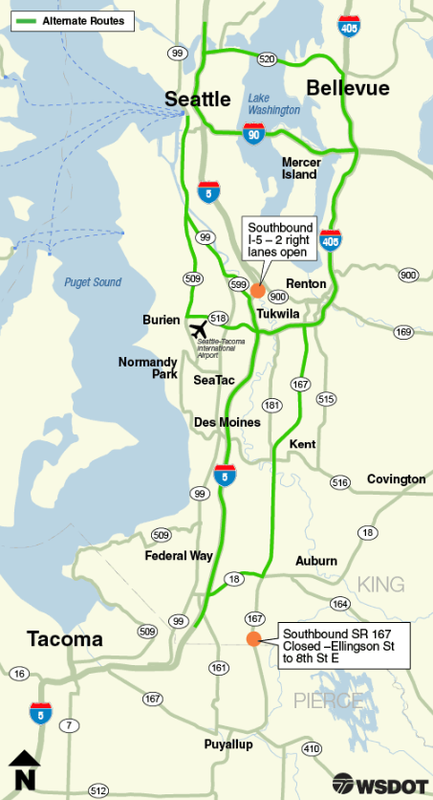 On Aug. 12-15, we'll do expansion joint replacement and drainage work on southbound I-5 in Tukwila. The big finale is Aug. 19-22. 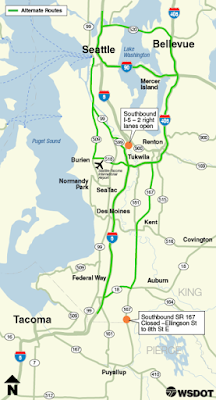 In addition to replacing expansion joints on I-5 in Tukwila, southbound State Route 167 will be closed in Pacific to place a culvert under the highway. We know lane closures can be difficult, but we're asking everyone to work together through this project. Between our crews and attentive drivers, we can keep everyone safe as we do the Hokey Pokey this weekend, and really, that's what it's all about! We're waving a fond farewell to the old SR 520 floating bridge after 53 years of stalwart service. Vulnerable to wind and waves, the old bridge is now a relic, replaced by a bigger, stronger and safer floating highway. 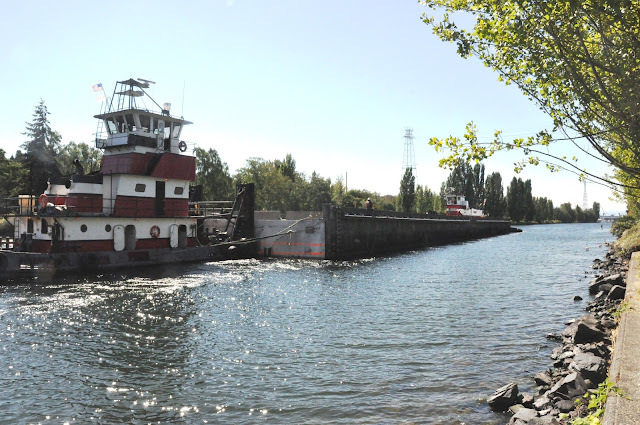 Our next step: take apart and remove the old span from Lake Washington, a process that will continue through the end of the year. Pontoon E from the old SR 520 bridge floats through the Lake Washington Ship Canal on its way to the locks. 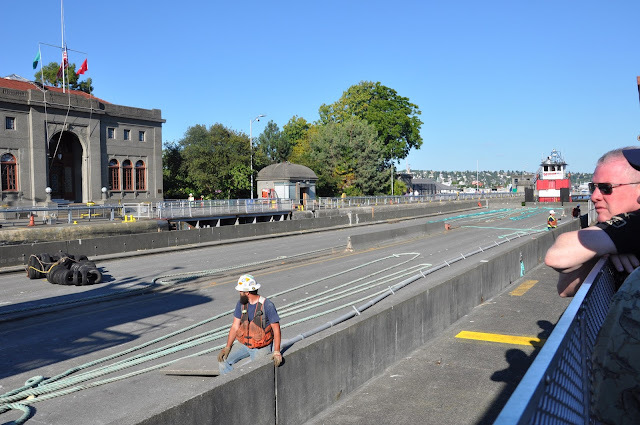 One of the most exciting parts of this process happened Wednesday, July 20, when we towed the first of 31 old floating bridge pontoons from Lake Washington and through the Hiram M. Chittenden Locks in Ballard on its way to new endeavors. Powerful tugboats guided the massive floating piece of concrete along Seattle's waterways. Like most of the old bridge's 30 other pontoons, Pontoon E is 360 feet long and weighs about 4,725 tons– the equivalent of around 500 adult Orca whales. Towing these enormous boxes of concrete from Lake Washington is a major step in the old floating bridge decommissioning process. pontoons are following the same route as the new floating bridge pontoons, but in reverse. That process is moving along. We removed both the east and west high-rise trusses from Lake Washington in June. In preparation for removing their columns, girders and other concrete superstructures before they are floated out, we also separated four pontoons from the west end (A through D) of the old structure. What's going to happen to the old bridge? All 31 massive pontoons make up approximately 75 percent of the old bridge's mass. We will dismantle the old floating bridge's remaining components onsite, then haul them away to concrete-recycling facilities. We'll process most of these materials for reuse on other paving projects throughout the region. So while the old SR 520 bridge will soon be gone, the traveling public will benefit from its recycled components for years to come. Once traffic shifted onto the new floating bridge, WSDOT' contractor on the project—Kiewit/General/Manson, A Joint Venture (KGM)—took ownership of the old bridge. They now have responsibility for decommissioning the old bridge, including removing the old pontoons from the lake. We've sold all 31 pontoons to TrueNorth Operations Group, which in the past has resold old pontoons for use as wharfs, docks, storage facilities and artificial reefs. Although we don't know the final destination of the pontoons, we know they will be put to good use wherever they end up in the world. Want to see the next float out? If you missed this float out, check out our Facebook Live video report as Pontoon E enters the locks. You can also follow the movement of the 30 other pontoons, which will be floated out of Lake Washington in coming weeks, by following SR 520 on Twitter. If you are interested in watching in person, check out our graphic of suggested viewing locations and join us in commemorating the end of an era. Remember in the movie "Cars" when Lightning McQueen was sentenced to repaving a section of highway before he could leave Radiator Springs? He races through the work and yeah, technically the road's paved, but it's a horrible mess. He ends up having to repave it, and learns his lesson. That's something we want to avoid, but that's also why we have weekend-long lane reductions for our #SouthKingSlowdown project. In order to do this project right, we need full weekends and not just overnight closures. We'll have lane reductions for a total of five weekends on southbound I-5 this summer: three this month to repave 2.7 miles in SeaTac and Des Moines and two in August to replace four expansion joints on the southbound I-5 Duwamish River Bridge. We've talked a lot about what it takes to replace expansion joints, so you probably understand that. The bigger joints simply can't be done overnight. It takes a weekend. But paving? Does it really take a whole weekend? In this case, yes. If you're just putting asphalt over asphalt, that can be done with overnight lane reductions. Just do some grinding, then pave. When you're putting asphalt on top of concrete, it's a whole different story. The section of I-5 in SeaTac and Des Moines is made of 12-foot by 15-foot concrete panels. These panels are more than 50 years old, and more than 500 are broken and need to be replaced. It'd take a couple of years to replace those during overnight lane reductions. Eventually, they'll all break and need to be replaced. We studied the best way to repair this section and determined it would be more cost-efficient to repave it with asphalt. To do this, during weekend lane reductions our contractor crews are taking out a football-field length of concrete panels at each end of the work zone and replacing them with asphalt. This creates a smooth transition from concrete to asphalt and back again. the transition before that section is paved with asphalt. As for the rest, you can't just put asphalt on old concrete. Old concrete panels move. It's slight, but if you put asphalt on top of those panels, they'll continue to move and crack the asphalt. So before we put down the asphalt, we're using a process called "crack and seat." Our contractor is using a machine to crack the concrete. After a 35,000-pound roller compresses, or "seats" it, we can put asphalt on top of it. The video below is of a machine that drops a six-ton blade onto the concrete panels, cracking them. A 35,000-pound roller then compresses the roadway to create a stable base for asphalt paving. Asphalt paving is time-consuming. We need eight inches of asphalt here, enough to support the more than 100,000 vehicles that use it each day, and it has to be paved in layers. Each layer needed to be compressed by a heavy roller for strength, then it has to cool for 30 to 60 minutes. Then we repeat the process a couple of times. For now, we have just the first layer on the right side of the interstate. That's OK for a couple of weeks, but for the best final product, the rest of the layers need to be paved soon. Spreading out that paving over a couple months of nighttime lane reductions could diminish its durability. With the weekend lane reductions, in a couple of weeks we'll have repaved this 2.7-mile section of I-5 the right way. We know that closing lanes on a summer weekend is tough but this is vital work that needs to happen when we have predictably dry weather, and so we appreciate your patience, understanding and cooperation. And as Lightning McQueen learned, taking the time to do the job right the first time is the only way to go. We all know a lot can happen in nine months, including over 11 million vehicles traveling in the I-405 express toll lanes. What's more, tolls collected from those trips will help fund new I-405 capacity sooner than we thought. More vehicles are moving through the express toll lanes than ever before. Our numbers from the spring show the express toll lanes are now carrying more vehicles on weekdays from 5 a.m. – 7 p.m. than they did in the winter operating 24/7. We're also seeing that when people choose to drive in the express toll lanes, it frees up space in the regular lanes. Travel time savings are up, even in the regular lanes. All lanes of I-405 are moving more vehicles at faster speeds than last year, though the express toll lanes are providing 40 percent faster trips than the general purpose lanes. The exception? Northbound general purpose lanes between SR 522 and I-5, where travel times are three minutes slower than they were last year. We have plans to fix this bottleneck using hard shoulder running (more on that later). As demand increases, so does the average toll rate. The nine month average is $1.61—up from $1.26 during the initial three months of operations. More drivers are using the lanes, which mean higher rates, especially north of SR 522 where express toll lane capacity is limited to a single lane. 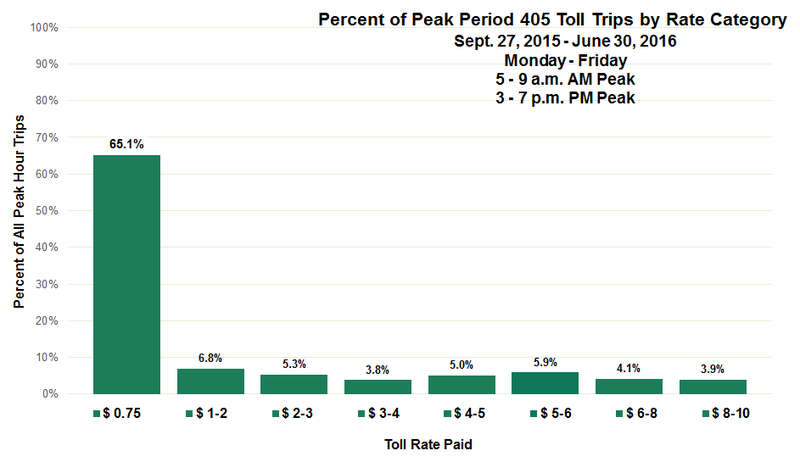 However, the most common toll rate during peak hours this spring was still just 75 cents. We're hitting the $10 max toll more often. Toll rates adjust to keep the express toll lane flowing at 45 miles per hour 90 percent of the time, taking into account volumes in the express toll lanes and the regular lanes. We're seeing frequent $10 maximum tolls at access points between Bothell and Lynnwood, where demand is high and capacity reduces from five lanes to three lanes, creating a bottleneck. While we're meeting our 45 mph 90 percent of the time goal, we see speeds drop below 45 mph when drivers enter the express toll lane when it's already at capacity. However, even when the express toll lanes are operating at slower speeds, they are still typically faster than the regular lanes. Express toll lane revenue is much higher than forecasted. With more drivers choosing the express toll lanes than we predicted, our revenue numbers are nearly three times the original forecast from 2012. There are some key reasons why our original forecast was so off, namely WSDOT is one of the first agencies in the nation to implement lanes that offer both electronic and pay-by-mail options for travelers, offering drivers an option to use the express toll lanes without a pass. In addition, the economy rebounded quicker than expected – creating new jobs and increasing traffic. The increased revenue is good news for drivers because besides covering our operations and maintenance costs, we're working with the legislature to fund our first reinvestment of your toll dollars in the corridor. The first project that could receive express toll lane funding next year is the Northbound Hard Shoulder Running from SR 527 to I-5 Project. Through this project, we will add additional capacity during the northbound evening peak commute period by opening the northbound shoulder to general purpose traffic. We'll have more details on this project in an upcoming post. Does this sound familiar? You're driving down Interstate 205 in Vancouver and traffic near the Mill Plain off-ramp is backed up onto the freeway. Or how about this? You're merging onto I-205 to head north from Mill Plain Boulevard… and because of the backup you don't know if you should speed up or slam on your brakes to enter the freeway. These are things we know are a problem, but these will soon be a distant memory. Why? 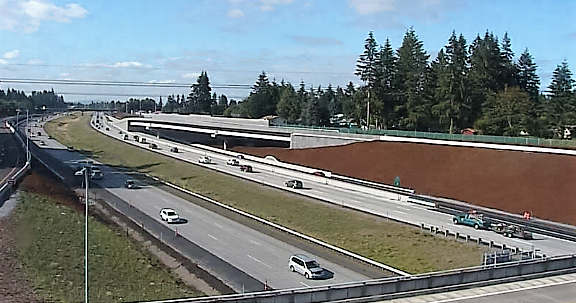 Because after 329 days of construction, a new interchange connecting I-205 to Northeast 18th Street will open this week and help make things better. The I-205 and Mill Plain Boulevard interchange is the busiest in Clark County, with more than 100,000 vehicles using this stretch of interstate daily. If you drive through this area, you'll notice there isn't an on- or off-ramp for three miles between Mill Plain Boulevard and State Route 500. When the new Northeast 18th Street ramps open this Wednesday, that distance will be cut in half. You'll have a new access point into east Vancouver, which means less vehicles using Mill Plain Boulevard and SR 500. For the first time ever, you'll be able to get onto southbound I-205 from Northeast 18th Street. We built a roundabout at the intersection, so you won't have to wait through a light to get onto the highway. The roundabout also keeps local traffic moving through the area. The longer separated off-ramp takes traffic off the interstate sooner and reduces backups onto the mainline. Slowdowns and collisions often occur near merge areas. By separating the on- and off-ramps there's more distance for drivers to merge or exit, without crossing paths with traffic doing the opposite, which means fewer crashes. The extended on-ramp gives you more distance to merge onto the interstate, which means more time to accelerate to the speed of traffic. The end result is an interchange that'll give you a smoother ride with improved travel times and safety. While the on- and off-ramps open this week, additional work to finalize the project, including landscaping, is expected to continue through the end of this year. One of Superman's powers is X-ray vision. While there's only one Superman, we want you to imagine you have that same power and peer into the earth with us so you can see an unusual culvert replacement project in Woodinville. Little Bear Creek, and the culvert that will be replaced in part by building a buried bridge. 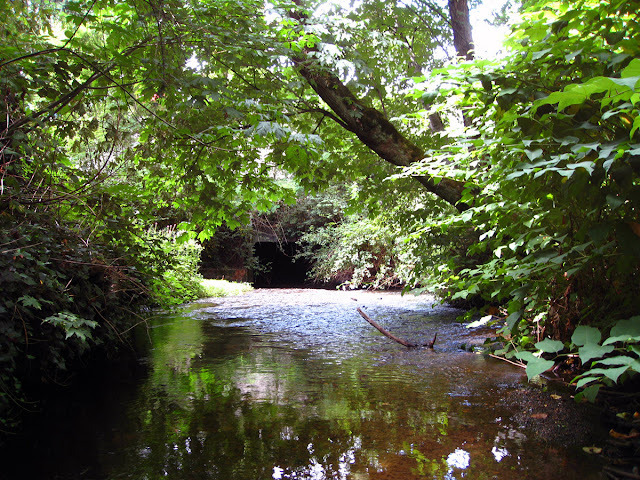 Usually, replacing a culvert involves closing a road, digging up the existing culvert and installing a new one. But Little Bear Creek is 30 feet below SR 202/131st Avenue Northeast. The typical approach doesn't work here. That's because we'd need to close the road for about a month and dig up a huge amount of dirt to safely reach, remove and replace the culvert. A month-long closure of the main entrance to Woodinville is neither practical nor something we wanted to put Woodinville drivers, businesses and residents through. 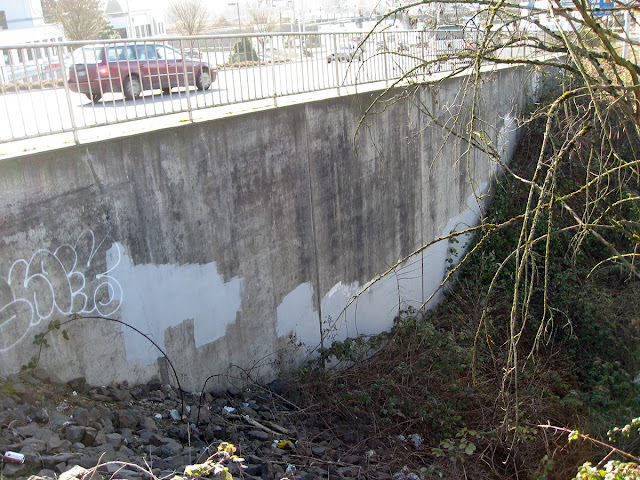 Crews will break through this large concrete wall in order to build a buried bridge as part of a culvert replacement project. So our engineers devised another plan: build a bridge underground and then excavate underneath it to reveal the belly of the bridge and a bigger space for Little Bear Creek to pass under the road. But no matter what words we use to describe how we're going to build a bridge underground, it's still hard to visualize. So, we're going to show you. You just have to picture yourself in waterproof boots, standing in Little Bear Creek, and that you have X-ray vision that allows you to see through a concrete wall and into the earth. 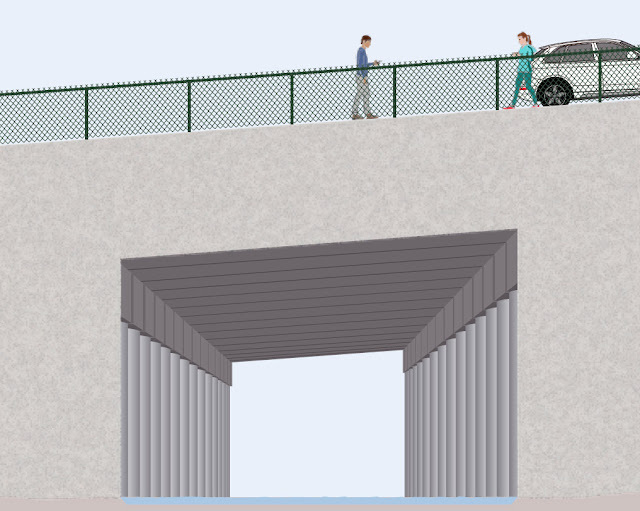 Scroll through the building a buried bridge graphic (pdf 3.44 mb) we've created to see how we'll build the bridge. What the buried bridge at Little Bear Creek will look like. Contractors will start drilling through the top of SR 202/131st to start building the bridge the night of Monday, July 18. We'd recruit Superman, but as far as we know, he doesn't have the power to drill holes into the earth, so we'll have to rely on good ol' fashioned heavy equipment for it. Our state is on the cusp of a projected population growth of more than 20 percent during the next 20 years. In addition, Washington’s residents and businesses are changing the ways we communicate, connect, travel and transact. The future of transportation will be defined by new kinds of approaches and business relationships among communities, government agencies and service providers. Influenced by trends like aging baby boomers, the suburbanization of poverty, technological advancements, aging infrastructure and urbanization, our future transportation system must work differently than it does today. 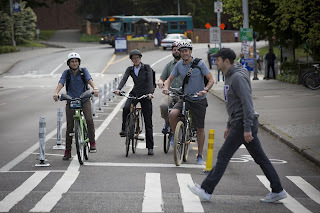 Among other changes, it must make even better use of buses, bikes, walking, ridesharing, telework, ferries, trains, park and rides, and other commuting and transportation options. 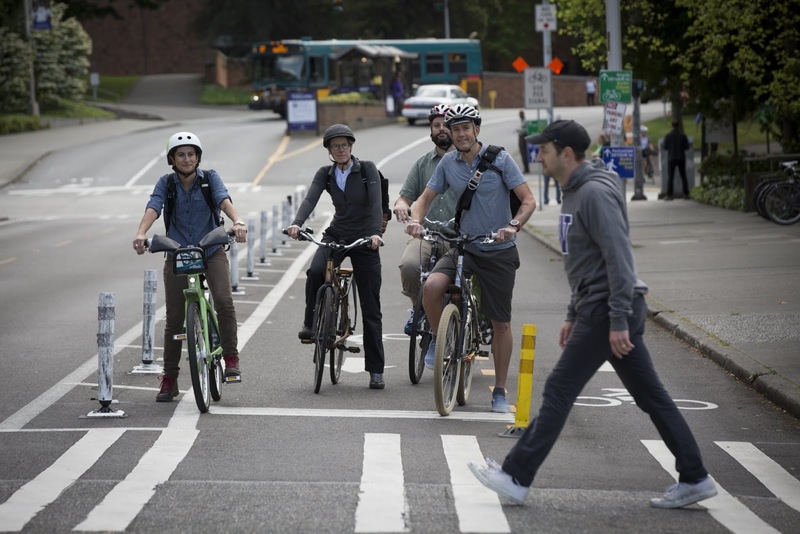 Collaborating with partners throughout the state, the recently updated Washington State Public Transportation Plan provides a 20-year framework to guide the state toward higher-performance, multimodal transportation solutions. Acting Secretary of Transportation Roger Millar said it best: This plan sets a future direction for Washington’s public transportation that supports families, communities, the economy and environment. Indeed, this plan is truly reflective of all Washingtonians. Throughout its development, we’ve worked with our partners to engage the public, public transportation providers and other experts throughout the state in conversations about key issues like economic growth, technology and vulnerable populations. Public transportation already plays a crucial role in our transportation system, our communities and in our state. Transportation providers and local leaders are working together to boost the value that public transportation adds and deliver a more sustainable, adaptive and responsive transportation system. The near-term actions outlined in the plan identify our next steps, and we have a progress report planned for December 2017. If you have driven across the State Route 104 Hood Canal Bridge this week, chances are you've encountered the bridge closed for maintenance work. In fact, we've heard from several commuters frustrated at the number of closures and are asking why we can't perform the work at night. Every year, the bridge undergoes what is called a Blue Ribbon Inspection. It's an independent, two-week inspection performed at random times. All of our floating bridges undergo similar inspections. It includes a "watertight" inspection and a mechanical/electrical inspection. 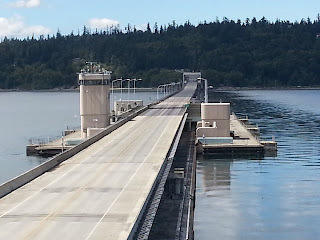 The Hood Canal Bridge is undergoing the mechanical/electrical portion of the inspection during the weeks of July 11 and July 18, which require several maintenance closures to measure and monitor those systems. by professionals who are not responsible for the day-to-day bridge maintenance. Why does this happen during the day? To help reduce the number of times the bridge closes to traffic over the next two weeks, the inspection-related maintenance openings are being combined with marine openings whenever possible. The openings and inspections require coordinated work with crewmembers, engineers and inspectors, and it is not practical for all those involved to limit the openings to only night hours over the two-week period. In addition, the inspections require daylight to see inside tight spaces and to get detailed observations on bridge components and operations. Our crews are very aware of the effects on traffic from maintenance openings, and they try to minimize impacts by timing the openings with lower traffic volume time periods and keeping the closures as short as possible. The typical opening can last between about 15 minutes to up to about one hour. Blue Ribbon Inspections came about following the 1990 sinking of the I-90 Lacey V. Murrow floating bridge in Seattle during a windstorm. Then-Governor Booth Gardener established a Blue Ribbon Panel to investigate the circumstances that led to the sinking of the bridge. The result was mandated annual Blue Ribbon inspections that were required by the Transportation Commission. The inspections are performed by professionals who are not responsible for the day-to-day bridge maintenance. The timing of this Blue Ribbon Inspection at the Hood Canal Bridge had nothing to do with the unfortunate seven-hour closure of the bridge on Sunday, July 10 and had already been scheduled for these two weeks. We know that every time the bridge closes to traffic it's frustrating. We encourage drivers to sign up for our free text/email alerts to get as much advance notice as we are able to provide and we appreciate your patience as we get through this important inspection process. Fourth of July has come and gone, but in the Evergreen State that means our summer is just getting started. 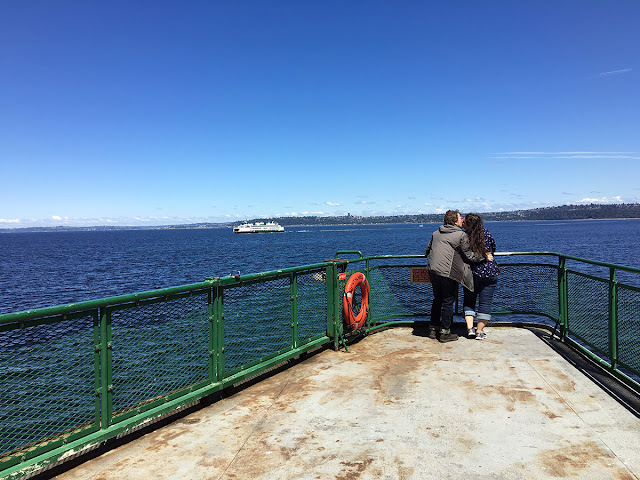 As always, it's a time of year full of events, starting this weekend when we expect thousands of people to flock to our ferries as a great way to reach the fun. With the sunshine out at times (we hope! 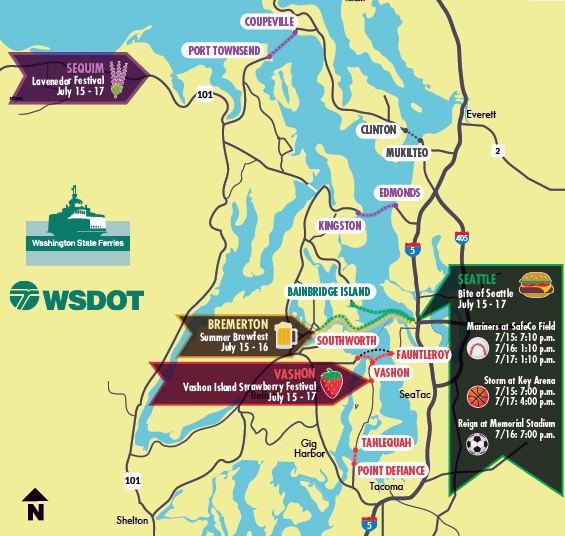 ), and plants in full bloom, locals and visitors alike will be sailing to several locations in the Puget Sound (pdf 520 kb) to celebrate local crops, food, and fun. It's hard not to smile with this view on your next weekend adventure. **NOTE** An extra sailing has been added on Friday to accommodate fans. 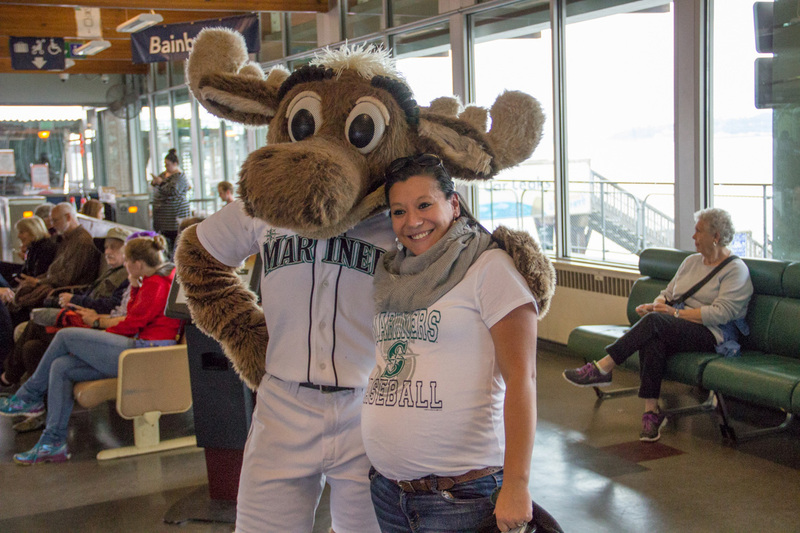 It will leave Bremerton at 10:15 p.m. and leave Seattle at 11:30 p.m.
Expect to see Mariners fans throughout the weekend at Colman Dock heading to the games. If you're joining in on the festivities and traveling on Washington State Ferries, be sure to plan ahead and make vehicle reservations as needed. Seattle's Colman Dock on a sunny day. It's go time for our #SouthKingSlowdown weekends! Yes, we know, we've been talking about this for awhile, and yes, it was supposed to start last weekend, but rain delayed the first of our five weekends of lane reductions for major roadwork in South King County. But the forecast is favorable for this coming weekend, so let's get ready...again. roadwork in South King County. away, southbound SR 167 will be closed. This time, though, we have a bit more news to share. 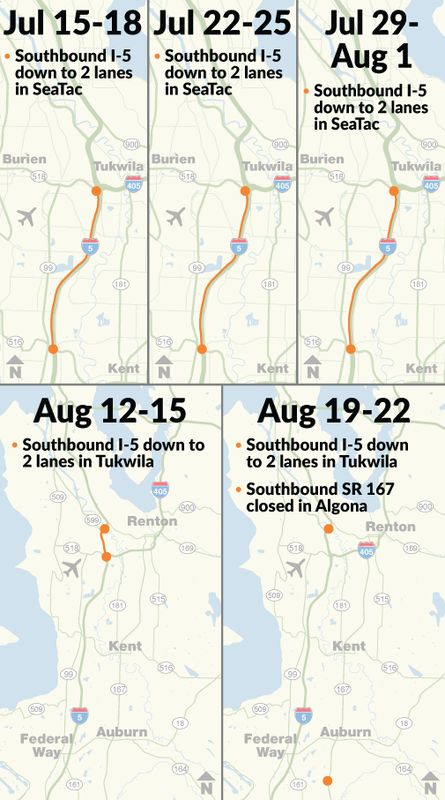 Besides the five weekends of lane reductions on southbound I-5, there will also be a full closure of southbound State Route 167 in the Algona/Pacific area in late-August. You might be thinking, "Why on earth would WSDOT throw a double-whammy of major southbound weekend construction work at us? How are we supposed to get around?" Fair questions. 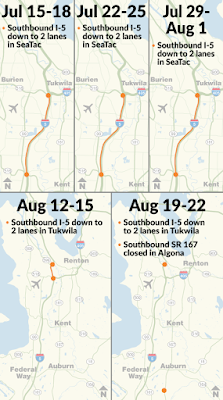 While lane reductions and closures on both southbound I-5 and southbound SR 167 sounds daunting, the two closures are actually 18 miles apart, and there are several alternate routes to give drivers options get around. To help navigate the closures, we've created a new #SouthKingSlowdown calendar webpage that breaks things down by weekend. You'll find maps of the work areas, alternate route ideas along with a list of special events for each weekend that may add to the congestion. As we mentioned, the weekend of Aug. 19-22 be especially busy. In addition to reducing southbound I-5 to two lanes at the Duwamish River Bridge, all of southbound SR 167 between Algona and Pacific will be completely closed between Ellingson Road in Algona and 8th Street East in Pacific for the SR 167 Southbound HOT Lane Extension project. The work will include paving 1½ miles of SR 167 and installing a large portion of a new Jovita Creek fish culvert under the highway. We've highlighted all the alternate routes around both closures in our map. Again, remember, this work is almost 20 miles apart from each other so one shouldn't affect the other and there will be plenty of options to get around it. There's never a good time to close lanes of traffic, or completely close a road for that matter. Some of this work has to be done when we have dry weather, and some of it requires full weekends to get done. In the case of the SR 167 closure, we're condensing what would be 30 nighttime single-lane closures into three days of full closures. We hope this new webpage will help you find your way around the closures, and we also suggest downloading the WSDOT app for live traffic maps and information, and following us on Twitter for further updates on the project and traffic conditions. And as always, we appreciate your patience and cooperation as we get this important work done. Human error, and not a faulty part, caused the seven-hour closure of the Hood Canal Bridge on Sunday. It’s a humbling experience to have thousands of people know about, and be unhappy about, one’s mistake. But we know it’s our responsibility to be forthright and accountable for our actions in operating and maintaining our state’s highways and bridges. During routine preventative maintenance on the Hood Canal Bridge last week, a valve was inadvertently left closed on one of four hydraulic lift cylinders. These hydraulic lift cylinders raise and lower sections of the bridge during marine openings. When the valve was left closed, it limited the supply of hydraulic fluid to that hydraulic cylinder, causing the lift span to rise unevenly during an 8 a.m. marine opening on Sunday. Those who were caught in the seven-hour closure know the rest of the story, and likely have their own personal stories on how they adjusted their travel plans. We apologize deeply for this error. As a result of yesterday’s incident, policies for opening the lift span will be revised to include more quality assurance checks and additional test openings of the span following specific maintenance procedures. Items such as placing signs on the valves as a reminder to open them after maintenance will also be installed. We are taking these steps to ensure that this type of event does not occur again. Our bridge crews take great pride in maintaining the Hood Canal Bridge. They understand just how vital the bridge is to Olympic Peninsula residents, businesses and visitors. They work hard every day to ensure the bridge is safe for travel, and this humbling reminder is an example of how we will work to do even better for the public we serve. The SR 104 Hood Canal Bridge is OPEN to traffic! WSDOT appreciates everyone's patience and cooperation today. A special thank you to the Washington State Patrol for your assistance. 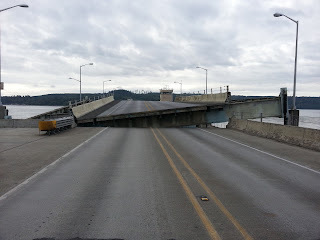 SR 104 Hood Canal Bridge as of 2:26 p.m. Sunday, July 10. 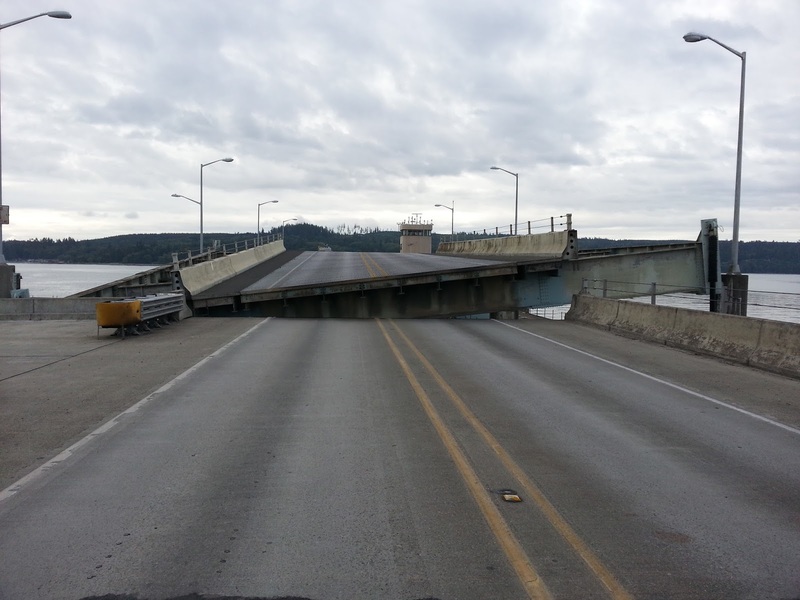 The SR 104 Hood Canal Bridge remains closed to vehicle and marine traffic. Bridge engineers were able to safely lower the lift span back into its lower position by dissembling a guide on the bridge. Crews are now reinstalling the guide. Bridge engineers will inspect the structure prior to opening it back up to traffic. malfunction on Sunday, July 10, 2016. During an 8 a.m. marine opening on Sunday, July 10, the State Route 104 Hood Canal Bridge experienced a mechanical malfunction on the west half of the bridge. Unfortunately this has resulted in a temporary closure of the bridge to vehicle and marine traffic until further notice. The Washington State Department of Transportation bridge crews are in the process of manually closing the bridge. It is a process that could take several hours. Drivers should be prepared for long delays and consider alternate routes. WSDOT apologizes the inconvenience this potential delay poses to travelers and will make every effort to reopen the bridge to vehicular traffic as soon as possible. 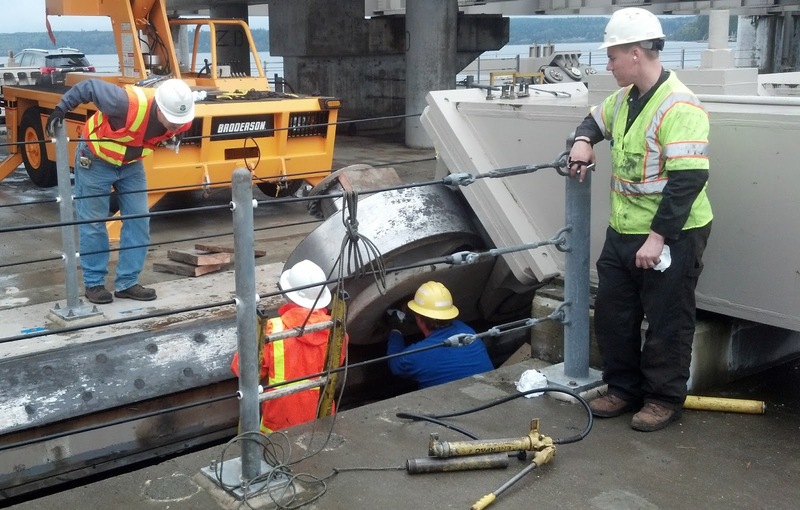 Federal regulations require WSDOT to open the drawspan to mariners within one hour's notice. This blog will be updated as new information becomes available. crews continue major highway improvement work. Note:This work has been canceled this weekend. The sun is (mostly) shining, vacations are underway and roads are (mostly) dry. That's right, it's summer, and that means it's construction season in the Pacific Northwest. While the weather here lets us get some work done year round – unlike our friends in the Midwest – much of what crews need to do to make sure roads are safe for our use is weather dependent, making the summer months around the state busy ones on our roads. Another #WSDOTbusywknd is coming up (I see you rolling your eyes saying to yourself, "they've all been busy weekends!"). This one is going to be construction busy though – not just event busy. Take a look. In case you need any help with the above illustration, here's what's happening in the Seattle area Friday, July 8 to Monday, July 11. Eastbound I-90 between Seattle and Bellevue will be reduced to one lane and detoured into the express lanes from 11 p.m. Friday to 5 a.m. Monday. If you need to head east across Lake Washington early Sunday morning plan ahead for a slightly longer trip as a rolling slowdown will cause delays of up to 15 minutes between 3 a.m. and 5 a.m. for crews install a new sign bridge near the entrance to the Mount Baker Tunnel. To accommodate the rolling slowdown crews will close the ramps from both directions of I-5 to eastbound I-90 from 2:30 a.m. to 5:30 a.m. on Sunday, July 10. During that time drivers should follow the signed detours and use Fourth Avenue South to access eastbound I-90. This closure is a make-up due to that March windstorm when SR 520 had to be closed and we needed crews to pick-up and open I-90 during a previously scheduled closure weekend. 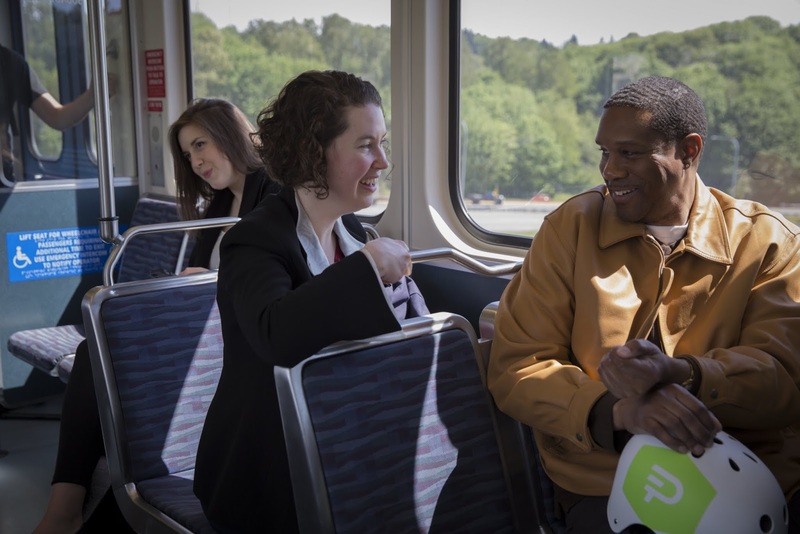 Read more about this project that's extending the HOV lane from Mercer Island to Seattle and preparing the express lanes for Sound Transit's East Link light rail project. #SouthKingSlowdown kicks off weekend reductions! This work has been rained out and will be rescheduled at a later date. Friday night, the Dixie Chicks play at White River Amphitheater so plan for delays in and out of that area along State Route 164. Saturday at noon, the Sounders have a big match at CenturyLink Field against the LA Galaxy. This is another good chance to consider using transit. Sound Transit is running event Sounder service from Lakewood and Everett (and points in between) to the match. for continued work on the Mt. Baker and Mercer Island tunnels. So, another #WSDOTbusywknd – we appreciate you taking the time to plan ahead, know alternate routes and being an engaged community member so you can try to stay out of traffic and help minimize the congestion for your neighbors as well. 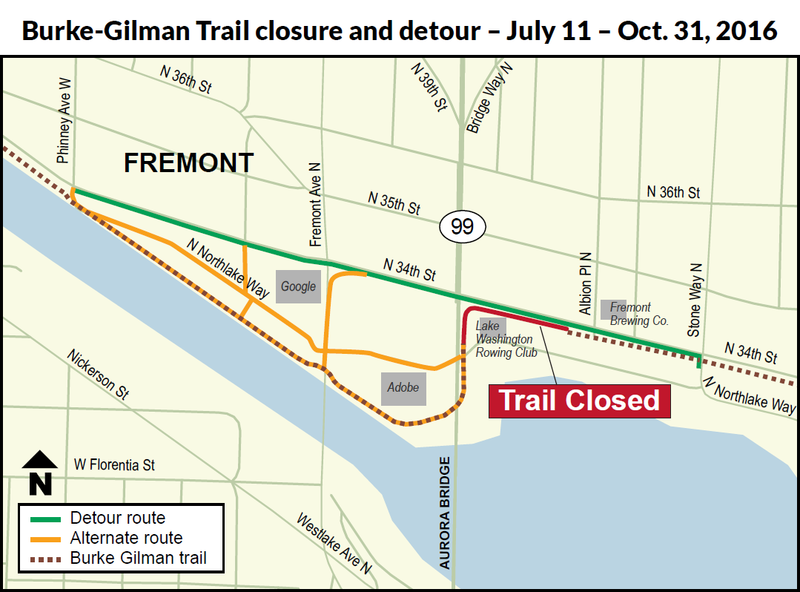 The planned closure of the Burke-Gilman Trail through Seattle’s Fremont neighborhood on Monday, July 11 is postponed. WSDOT will work with the bicycle community, the City of Seattle and others on next steps to provide passage for bikers and pedestrians near the Aurora Bridge work zone. Cyclist who use the Burke-Gilman Trail to commute to work, visit Golden Gardens or grab a tasty treat along the route will have a slight detour for the next few months. 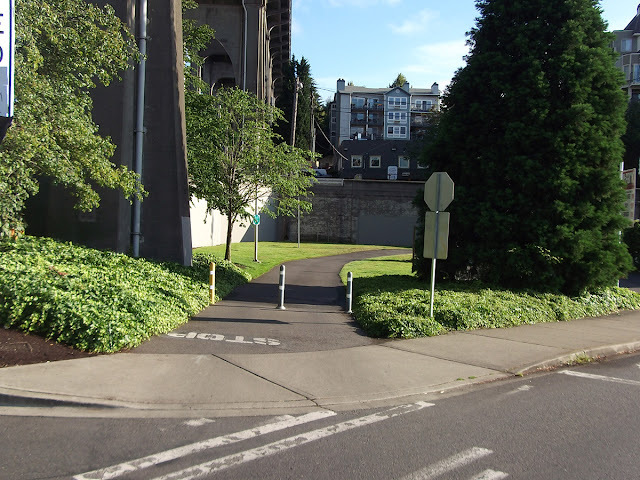 A short section of the trail in Seattle's Fremont neighborhood will be closed for safety reasons as crews continue their preservation work on the Aurora Avenue Bridge. It should reopen by Oct. 31. Why is the closure necessary? Cleaning and repainting the historic Aurora Avenue/George Washington Memorial Bridge requires some big equipment that must be located close to the bridge. The area immediately west of the Lake Washington Rowing Club is the only suitable location to place this equipment. It wouldn't be safe to have trail users trying to negotiate their way through the area so it was agreed that to keep trail users safe, that section should be blocked off. section of the trail that will be closed due to safety this summer. We recognize that this is a busy time of year on this trail for regular and seasonal cyclists. The timing of the closure is driven by the progress made on the project. We appreciate trail users planning ahead and being patient during this work. Preservation of this iconic bridge is critical to ensure that it remains safe for years to come for all those who use it and the people who live, work and play below it. The trail will be closed from the crosswalk immediately west of the Lake Washington Rowing Club to the west end of the office building at 1000 North Northlake Way. until about late October while the bridge painting project is overhead. The trail will begin closing at 8 a.m. on Monday, July 11. The small U-Park immediately west of the rowing club will be closed. The crosswalk on North Northlake Way will remain open. Cyclists and pedestrians will follow a signed detour that runs east-west on North 34th Street between Phinney Avenue North and Stone Way North. There are also numerous routes between North 34th Street and the trail that cyclists and pedestrians can use. We encourage everyone to use caution on these alternate routes. Our contractor will move the equipment to ensure the trail is open for designated special events, such as the Lake Union 10K in August. WSDOT and the contractor are working closely with the City of Seattle to continue to identify events in the area that need to use the trail.